New data suggests older iPhone 3GSs and iPad 1s outsell individual competing units from Android. It may be the most compelling evidence yet that Apple has an iPhone 5 “Lite” in the works. It’s perhaps the most convincing clue yet that Apple may be coming out with an iPhone 5 “Lite”: Older iPhone 3GSs and iPad 1s are outselling individual competing units from Android handset makers. According to research from Canaccord Genuity analyst Michael Walkley, Apple’s strategy of keeping the old-gen iPhone and iPad on sale beside newer devices, at a lower price, is working well. 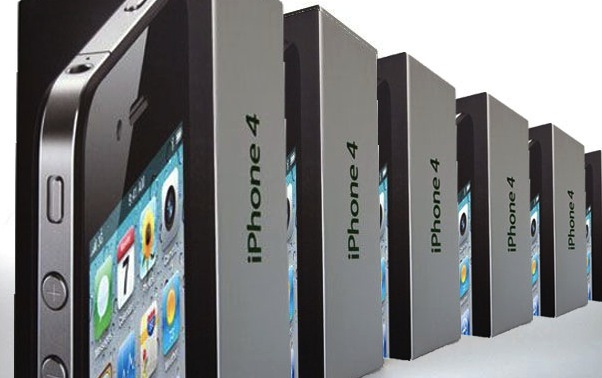 While the iPhone 4 is “by far” the best-selling single handset type from both AT&T and Verizon, the iPhone 3GS frequently outsells individual Android handsets from other vendors–even new editions. As specific examples, Walkley found that the 16GB and 32GB versions of the iPad sold out inside two weeks of the iPad 2’s debut, and that the iPhone 3GS sold better than the HTC Inspire and Motorola Atrix on AT&T. The question is: Can Apple sell its high-tech, experimental design iPhone 4 at a reduced price alongside the upcoming iPhone 5, extending this revenue generator yet another year? The economic benefits would seem to point in this direction, since Apple’s supply chain will have all the tooling, materials suppliers, and expertise already in place, and the bill of materials for the iPhone 4 will have been falling all the while it’s been in production (thanks to economies of scale and so on). This may be what happens. But it’s also possible that all those long-bubbling rumors the iPhone “lite” is en route may come true. Apple has already demonstrated it’s happy to adjust the mix of an on-sale iPhone with the Verizon CDMA edition, which sports a different chipset, and a slightly modified case design, so it’s possible it’s designed two new iPhones for this year (which could also explain the delay to a fall launch window). One may be the full-featured iPhone 5. The other may be a new iPhone with a smaller screen, smaller battery, and less memory but same A5 CPU, with similar body to the iPhone 4, but with expensive extras like the rear glass face replaced with cheaper parts. These are all tweaks that would significantly reduce the production price without necessarily degrading the user experience (particularly relevant is the smaller memory, which means the phones would benefit from Apple’s overhaul of MobileMe, widely expected to be cloud-centric). A drop in price like this would let Apple sell an iPhone Lite at a knock-down price, much as it has done previously with earlier edition iPhones, without necessarily fragmenting its platform, and enabling it to scoop up more of the low-end market that it’s partially ceded to Android. Most Creative Companies 2011: Apple.